Thank you for perusing our gallery as you may see something here that inspires! These items were 'one offs' not produced in quantity so if you see something you want, we'll recreate it for you. Contact us to place your order! Full sized - 84" wingspan - wood & glass - Anderson Arts Center 38th Annual Juried Show "Best of Show" 2013. Just off display at the Arts Center. 2,860 hrs to carve. 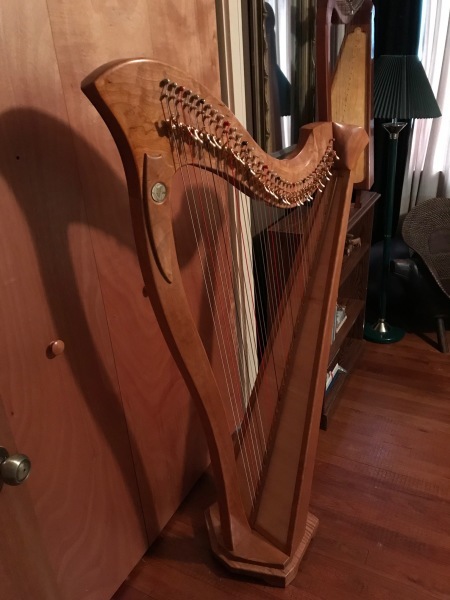 Inspired by the Queen Mary Harp, this 6" miniature is strung with 10 wires and features authentic Clarsach construction with a hollowed-out sound box, pillar, and arm. Its decorated with pyrographed Celtic religious symbols. Of sapele, brass, spring steel wire, and finished with hand rubbed shellac. It can be tuned and carries a fine note but is intended only for display. 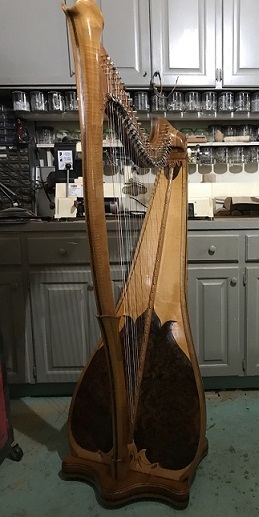 This new CELTIC 38 is beautiful to listen to, look at, and a joy to play! C1 - high A6 - low, 61" tall, 16"wide, and 35" deep, and weighs 39#. 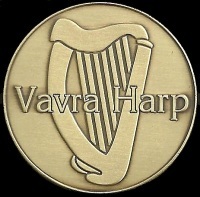 This is a premium harp with comparable features you would pay extra for from other manufacturers, in the $6,000+ range. Premium, exotic woods, Sitka Spruce soundboard, stave back, CAMAC levers, concert strings, custom carvings, high-gloss finish, and all of the acoustic engineering come together to make a truly wonderful listening and playing experience! Roasted curly maple, extended soundboard, burl walnut veneer over a solid poplar soundboard, full dark nickel Camac hardware and fully levered. Casters and K&K three-head transducer sound system with Behringer amp. Lots of carving with pillar external to soundboard gives this Custom Limerick a wonderful volume and overall voice. Fitted with Tornavoz rings. Comes with the stand. Thank you for perusing our gallery as you may see something here that inspires! Most of these items were 'one offs' not produced in quantity so if you see something you want, we'll recreate it for you. ANYTHING WITH A PRICE IS STILL AVAILABLE AS MARKED - Contact us to place your order!